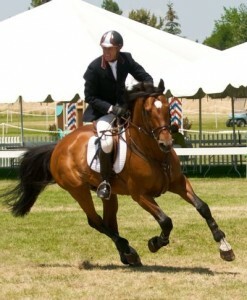 Caletino and Rich Fellers in the jumper ring at the Oregon High Desert Classic #2 in Bend, Oregon. After returning from a very successful trip to Spruce Meadows, Caletino continued his success in the jumper ring at the Oregon High Desert Classic #2 in Bend, Oregon. Once again competing on the grass jumping field, which he loves, Caletino and rider Rich Fellers were first in their 1.20M class and second in the 1.15M. On Sunday, Caletino’s fan club turned out to watch him compete in his first jumping “prix” class, the $2500 Sheri Allis Mini Prix, where he went double clean to finish fourth out of 22 entries.